Missouri's Claire McCaskill isn't the only Democratic senator up for reelection with money invested in a notorious offshore tax haven. 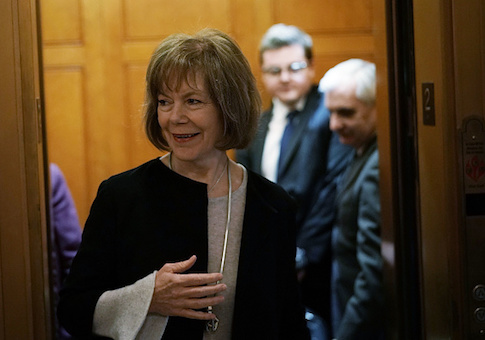 Financial disclosure forms for Minnesota senator Tina Smith, a still little-known lawmaker who inherited her seat last December after Al Franken resigned, reveal an investment valued at between $500,000 and $1 million in a hedge fund based on the island territory of Bermuda, one of the world's most notorious tax havens. The offshore asset is held by her husband, Archie Smith, an independent investor who had a prolific investment career working for various funds—he was once named the Wall Street Journal's stock picker of the year. Smith's financial disclosure reveals a vast investment portfolio valued at up to $12 million, mostly consisting of assets owned by her husband. One of the larger investments on the disclosure is the up to $1 million in "Pine Grove Offshore Fund Exempted Company Class A," which, though described in the filing as a hedge fund based in New Jersey, is actually based in Bermuda, according to its initial filing with the Securities and Exchange Commission. The fund's most recent filing, from February 2018, shows it remains in Bermuda. The fund declines to disclose the amount of assets under its control. Jen Gates, a spokesperson for Smith, maintains that the filing is "accurate," explaining that New Jersey is listed because it's where the fund's parent company, Pine Grove Asset Management, is based. The specific Pine Grove fund Smith chose to invest in, however, is based in Bermuda, which, like the Cayman Islands, has long been a magnet for investment funds because of its tax laws. In Bermuda, there is no corporate tax, no income tax, and no capital gains tax. Smith's campaign spokesman said the investment is part of his retirement fund. "This investment is part of Archie's individual retirement account, which, like the traditional IRAs that millions of Americans have, is tax deferred and he will pay taxes on it when he begins drawing on his retirement," said Gates. The campaign, however, also said Smith began the process of selling his investment in Pine Grove's Bermuda fund and plans to be completely out of it before his wife's November election. It is unclear whether this was due to the offshore aspect of the investment or a purely financial decision. The campaign did not share details such as how long the asset has been held and its exact value. Smith was not required before this year to disclose her husband's assets. As Minnesota's lieutenant governor—the post she held before being appointed to Franken's seat—Smith was only required by state law to disclose her own assets and assets held jointly between the two. The issue of offshore investments has arisen as a major issue in Missouri's Senate race, where two-term incumbent Claire McCaskill was called out for investing in an offshore fund even as she pushed legislation to crack down on the ability of hedge funds to use territories such as Bermuda to escape U.S. taxation. Smith, as a newcomer to the Senate, has a limited record on the issue. As lieutenant governor Smith helped push an ultimately unsuccessful plan to increase Minnesota's gas tax by 16 cents a gallon, which would have been the biggest tax hike in state history. Minnesota was estimated to have lost nearly $2 billion a year in income tax revenue to offshore havens, the sixth most of any state in the country, according to a 2013 study. Smith was victorious in Minnesota's Democratic primary earlier this month over Richard Painter, who attacked Smith over her husband's investments in medical stocks during the campaign, arguing that it causes a conflict of interest for Smith on health care issues. Smith will face Republican state lawmaker Karin Housley, who also easily won her primary, in November. This entry was posted in Politics and tagged 2018 Election, Tina Smith. Bookmark the permalink.